You want to be "the voice" of the radio show. You want to let the listeners know what they need and want to know. You want to have a strong and wonderful following. But, how do you accomplish this? We give you five tips on how to make it to the exciting life of being an On-Air personality in the radio world. Research everything. Make sure you absorb as much information as you can on the topics you plan to discuss. Although the very best radio hosts make it seem effortless, they're never "just winging it". That will only end in disaster. Cover your bases, and prepare yourself by jotting down key points, and punchlines. No matter how improvised the show may seem, great broadcasters have done their homework. So prepare, practice, and research! When DJs prepare the studio for their show, they put in tapes that record their parts of the show, or more simply it records only when the microphone is on. After the show is completed, these takes can be used for many reasons. The most important reason is for you to do an air check. You and the producer can sit down and listen to how your show went. You want to check the flow and delivery style along with anything else that you think can improve your show. For example, make sure to notice your "umms", "uhhs", and "likes". This helps aid in quality control and really helps you to improve your delivery. Remember! Nobody else has a recorded copy of your show, so don't be too hard on yourself. Air checks can also be used down the road for your demo, how convenient! Really connect to the audience. Bring your real personality to the broadcast. Some On-Air Personalities develop "characters" to amp up the entertainment. However, the best personalities speak from an authentic place, and contribute a truly unique perspective. Becoming a unique voice on-air is difficult, but finding your own voice can help make you stand out in the world of broadcasting. Also, be passionate. If you show the audience that you love what you do, they in return will feel that passion and become more involved with the show. It is important when hosting a radio show to talk about things that are relevant to your audience. For example, it wouldn't make sense for an adult contemporary station to talk about the new punk rock group coming to town. Sometimes it can be difficult to stay relevant. You might work at a radio station and you really have no interest in their type of music. You have to pay attention and talk about what your listeners want to hear, and not necessarily what you want to say. Are you motivated to become the next Howard Stern or Ryan Seacrest? DJs in today’s world need to have drive and enthusiasm to impress potential employers. However, the audience will determine if a DJ is on target. Always remember to stay positive, even if you're not at your dream station. Everyone starts somewhere. Keep in mind that the "stardom" that you dream about doesn't happen overnight. You have to keep practicing your craft, network, and take whatever jobs you can get at first to become the well-known radio host you long to be. Utilizing these five keys can help you reach the top. It all comes down to putting forth the effort to prepare your show, and reflecting on who you are to the audience. A hands-on education in broadcasting can be the ideal foundation for captivating all of these qualities and components. 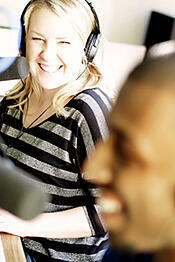 There are also many resources on the internet to help improve your radio show. All in all, the real trick is to just be yourself. Most people find unique personalities engaging, and to be interesting is to have your flaws. It can be a good thing to have personal quirks, or characteristics that stand out. Let your personality shine through, because in the end.. there is only one you. If you would like to learn about being on-air talent, click the button below.